A really fun summer weekend! We thinned the program down to music, a couple games and a lesson. No video, no high tech stuff...just old fashioned JH ministry and it was great. The lesson topic of kindness is a very junior high friendly topic. So much of the 'fruit of the spirit' is hard for students to really get their hands around, but kindness is a topic they deal with every day. We had a few of our regular volunteers who have been out much of the Summer make a return which added to the quality of the weekend. One, in particular, is the king of relational ministry and we have felt his abscence this summer so it was great to have him back around. The following is probably more therapeutic for me than it is of interest to you. - I've got a project due for grad school by August 1st. Failure to turn it in will result in failing the class. Yes, I've procrastinated. Yes, I brought this on myself. - I worked late last night frantically trying to finish two junior high lessons that won't be taught for a few weeks but since I'm speaking in adult services next weekend and then going to camp, I had to try to work ahead (a strategy I should have employed with school project!). - Speaking in the adult services is a week away, but I'm already feeling the pressure. Pressure that I put on myself much more than others put on me. - Camp is coming! I don't do a whole lot for it, but taking a bunch of kids to camp always carries a few surprises. - I bought my wife a car today. She's always wanted a Toyota Sequoia, but there's no way we can afford a vehicle like that. That is until a friend gave us the deal of a lifetime on his 2001 that is totally loaded. My wife has her dream car and I managed to stay out of debt. - It's my mother-in-laws birthday. We're having dinner with them tonight. She's an incredible lady and I feel blessed that in my seasons of stress, a night with my in-laws is actually something I look forward to. This book was mailed to me a couple of days ago and I was drawn to it instantly. I picked it up and couldn't put it down until I was finished with it. 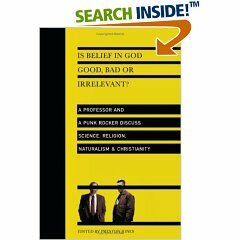 I found the exchange between the author (a Christian professor) and the musician (front man for the punk group Bad Religion) to be fascinating. Read it quickly the first time and then dive into it later to unwrap and digest the content. I don't know much about the Church of God denomination. I don't have friends in it, have never been to a Church of God church and couldn't tell you the location of the nearest one. However, this morning I spoke at the Anaheim Convention Center to over 1,200 Church of God youth workers at a massive Church of God youth convention. Every-other year, they host the 'International Youth Convention' that attracts about 6,000 Church of God students. To encourage youth workers, they run a small convention within a convention geared just for the adults. I was asked to speak in the general session this morning. Let me tell you...God is alive and well within the Church of God (good thing since it bears his name!). The room was packed with adults, some paid but most volunteer, who are making a huge impact in their ministries. I love the fact that the body of Christ is a big, diverse, unique and complex entity. God's spirit is at work in places and through people all over the globe. It's so easy to get caught up in our 'little bubble' of ministry and 1) assume that not much is happening that we don't know about or 2) assume that everybody views their faith through lenses similar to our own. Today I was reminded that both are poor assumptions. I just ordered this book. I've been told it's a 'must read'. For some reason I tend to question the legitimacy of books like this, so I hope the letters are the real deal. While surfing the net, I stumbled across this short list of fictional books written for the junior high audience. I haven't read them and I'm not endorsing them...just passing them along. Overall, a pretty good weekend. One of our interns, Stephen, spoke and did a fantastic job. He has built such good relationships with the kids that when he gets a chance to speak, students automatically respond. The big problem this weekend was a horrid stench at the entrance to our tent caused by three gallons of rotten milk. We have a beach-like sand area just outside our tent and somebody decided to dispose of milk left over from our beach camp by dumping it into the sand. Old milk mixed with 105 degree temperatures didn't mix. We spent about 20 minutes spreading out the sand, dousing it with disinfectant and hosing it down...none of which helped much. I'm speaking tonight at a big Brethren youth convention at Biola University just up the freeway. I was asked to speak to the youth pastors, parents, and youth workers about youth culture. Since I recently referred to Myspace as 'Myplace' in front of a bunch of students, I'm feeling a little inadequate in my ability to help others navigate youth culture. I'm going to throw them a little bit of a curve ball by speaking on grace instead. The truth is that youth culture moves so quickly it's easy to get left behind in our efforts to keep up with it all (Ie: Myplace)! But what never changes is the fact that teenagers are hurting and need an atmosphere of grace in order to best experience the grace of the Father. Plus, when you're speaking on grace it makes it pretty tough for the organizers of the event to get too ticked off if you miss the mark! In the hurry to get packed for camp (not sure why there was so much hurry because I only took a backpack with a pair of board shorts and three t-shirts) I forgot to grab my laptop and thus, had no ability to connect and post while away. Our first ever 'Beach Camp' was really fun. Here are a few things that stuck out. - Every student we took was TOTALLY into it. Nobody gave us grief, complained about stuff or otherwise made the trip miserable. We drove here and there for meals, loaded and unloaded tons of beach gear every day and had a super flexible schedule. Every single student had an amazing attitude. It was actually kinda weird! - Warm water. The water was about 72-73 degrees which is probably the warmest So. Cal water I've ever felt. - Lots and lots of surfing by everybody. I think every kid at camp stood up on a surf board. We had several adult leaders who spent the vast majority of their time pushing kids into waves, helping them paddle back out, and then pushing them into another wave. Very fun. - Our guest speaker. We asked Josh Treece, a former intern and current middle school pastor in San Diego, to speak two times. He was really, really good. He walked our students through the first half of Genesis and managed to hold their attention and give them really good insight into God's original plan, the fall etc. We couldn't have asked for a better speaker for our chapel times. - A really nasty rash. Probably because I only packed board shorts. No need to elaborate. - Generosity. We had a raffle at the end of the week at which time we gave away a $50 gift certificate to a surf shop and a new soft-top surf board worth about $200 from the same shop. Grace, an 8th grade girl, won the surfboard while an 8th grade boy won the gift certificate. Ahsley comes from a surfer family and has a garage full of boards and fully understands the value of the surfboard she won. However, she decided to see if the boy would want to trade her new board for the gift certificate. It was awesome. She could have returned the board to the shop and received $200 bucks in store credit, but she wanted to give the board away in return for the $50 certificate. Not often do you see a junior high student trade $200 for $50 just so somebody else can benefit. Pretty fun to watch...No wonder her name is Grace. - The Junior High RV. That's right, somebody donated a 1988 RV to our ministry about a day before the trip so we took it along with us. It made staying in a caravan super easy. "Just stay behind the slow moving, tan and beige RV and you won't get lost....."
We're heading off to a short, 3 day, beach camp. I'm sure I'll post while we're gone, but maybe not real consistently. One of the things I haven't done real well in the past, but want to improve is the role our ministry can play in equipping and encouraging parents. I think we do a great job of being 'family friendly' in how we plan programs and such, but we really haven't done much in the way of strategically targeting parents as a ministry focus. Two books I've read and will probably recommend are this one (a little old, but pretty good) and this one. I also like the direction Jim Burns and his homeward ministry are taking (a more progressive Focus on The Family without all the political stuff to muddy the waters). What have you done to minister to parents, and what resources have you pointed them toward? Frankly, this was one of our poorest weekends in quite a while. I was uncomfortable with my message from the get-go. As a result, I rambled and tried to save a talk that was doomed from the beginning. I shortened it, tweaked it and made it MUCH better for Sunday. Our sound system was experiencing 'technical difficulties' which made a struggling student band struggle even more! I have a good friend visiting from out of town who is also a Junior High Pastor. He reminded me of a very important truth in ministry. If kids connected with a caring adult, took a little step closer to Christ and had fun, then the other stuff really doesn't matter. There was a lot that went wrong this weekend, but I think the important stuff went right. We have some good friends from Chicago visiting us for a few days. We spent Thursday night at the beach and have been talking about surf culture ever since. Like every other industry, it seems like there's usually a pretty thin line between sucess and failure. Compare the Surf Kayak with this. Or the Flow Rider with this. That formula has worked for the past twenty years or so and I can't see it changing anytime soon. 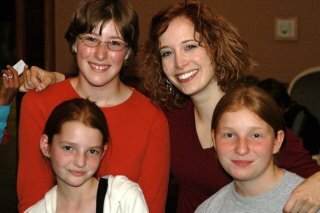 Sure, the caring adult may be ministering in the context of big programs, small groups, missions trips, ministry teams etc; all of which will morph and change with the times, but the need for a young teen to have a caring adult loving them unconditionally and pointing them towards the Father will always be the foundation of a good ministry to young teens. Parenthetical note: Of course judging by the picture above, our ministry could benefit from a bit more cultural diversity! Yesterday I spent about an hour being interviewed by a publishing company who is trying to take a fairly comprehensive look at the state of youth and children's ministry. Over the course of our time, I was asked a bunch of great questions that I felt fairly confident in answering. I was beginning to feel like quite the expert when she asked her final question...a question that really shouldn't have stumped me: "What do you think ministry to young teens will look like in 5 or 10 years?" Maybe it was the fact that I was 'on the record' and knew that my predictions might be read by my peers, or maybe just that I was tired after a 60 minute interview. I don't know why...all I know is that my answer that now is 'on the record' was pretty weak. "Ah...I'm no futurist but I could see the return of the big event that is balanced this time around with a stronger small group structure to back it up." STUPID! Don't get me wrong, I do think the big program/outreach/lights, camera, action approach to ministry is due for a comeback (not so much because I think it works but, because like everything else, youth ministry tends to run in cycles) and I think we've learned the importance of small groups and won't trade the small for the big, but might come up with a good blend of the two. But this was my chance to say something significant and profound...to sound really smart. So, to all you out there who are profound and smart: What will junior high ministry look like in 5 or 10 years? On February 9-12, Group Publishing and Simply Youth Ministry are partnering up for this new Youth Ministry Conference. What I'm most excited about is that they are offering, along with other tracks, an 8 hour block dedicated solely to middle school ministry! I'm going to have my hands in the creation of this track and I'm hoping it will be the most extensive and experiential middle school training I've been a part of. I like to fancy myself a bit of a pop culture aficianado, so I'm looking forward to this new show. Our student band kicked off the program with a super fun cover of the 80's hit 'Take On Me' by Ah Ha. That set the stage for a really great weekend. Our games were old school, and we had no video elements, but for some reason it was just a fun time! I got myself into a little bit of trouble with my lesson because my take on JOY was basically defining it as an inner sense of peace. This will be a little bit of a challenge for next week when I try to teach on PEACE without being redundant. - Rats multiply so quickly that in 18 months, two rats could have over a million descendants. - In comic strips, the person on the left always speaks first. - A snail can sleep for three years. - Turtles can breathe through their butts. - Donkeys kill more people annually than plane crashes. - Marilyn Monroe had six toes on one foot. - Donald Duck comics were once banned from Finland because Donald doesn't wear pants. - The average person spends 2 weeks of its life kissing. For the past two years we've ran an event called LIFT in place of a traditional winter camp. LIFT is really more like a convention than a camp. We hold it in a local hotel and bring in guest speakers, artists etc. We invite other junior high ministries from California, Arizona and Nevada to join us and have, in my opinion, provided a really fun experience for the students. Everything about LIFT has been fantastic except one: We can't stay on budget! We should be able to, but we can't. Even worse, we can't figure out why! So for 2007, we've decided that LIFT should partner with a fantastic ministry called Stuck In The Middle. Their primary ministry is to run conventions for young teens and they do a great job...plus they actually make money. Our arrangement with Stuck is basically that we will make sure the kids show up and they will make sure we stay on budget. We'll program the event together and blend the best stuff they do with the best stuff we do to create some sort of SUPER LIFT! We are in the very early stages of this new relationship, so I'm excited to see where it leads. P.S. When I went to our websites I noticed that both were outdated by at least a year. Hmmm...this whole thing could be interesting! I didn't want to look at this, but stumbled across the live broadcast while I was channel surfing on the 4th of July. It was hideously fascinating. When was the last time you felt overwhelmed with responsibilities....not just busy, but truly feeling like you couldn't possibly do what you needed to do in the time you had? I'm there. I woke up early this morning, not because I wanted to, but because I was suddenly hit with a sense of panic about what's on my plate in the next three weeks. I won't go into details here because what's on my plate is of no interest to you. What may be of interest to you is this question: How good are you at creating boundaries and maintaining a healthy pace? I'm never great at it, but right now I feel like I may be the world's worst example of time, life and work management. Believe me, I'm not sharing this as some sick, twisted 'look at me...I'm so busy and important' type of testimony. I'm embarrassed that I find myself almost resenting the ministry I love so much for no other reason than my own inability to properly lead my team and manage my time. AARRGGHHH! I meant to share this last week, but forgot. Last weekend I was sitting next to a 7th grade boy who was in our ministry for the first time, along with all the other new 7th graders. At one point during our singing time, the girl leading worship set up the next song by saying something like this: "Have you ever been to a baseball game when they sing the national anthem? Well, this next song is sorta like an anthem to God...it's our way of telling him how wonderful he is." As we started to sing the song, the 7th grade boy tapped me on my shoulder and asked "Hey, should I put my hand on my heart when I sing this?" A very funny moment. You may remember that I posted a few days ago about the fact that Stephen, one of our interns, ran the church suburban into a big planter in the front of a hotel we were staying at. 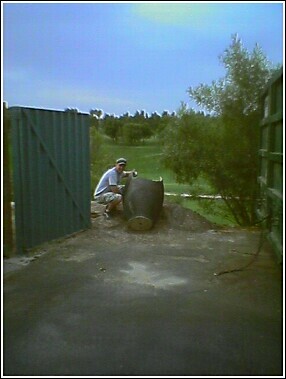 At that time, I posted a picture of him standing beside said planter. Fast forward a few days. My family is back at the same hotel and I'm driving around the side past some dumpsters. Suddenly, we see it....the planter. It's far too heavy to have been placed in the dumpsters so it's been tossed on the ground to the side of them. I couldn't resist the urge to take another picture. We are back in Palm Springs for our annual 4th of July vacation. Each year, we hook up with some old friends from Arizona and spend 4 days together. This year we invited several other families to join us. All total there are 8 families adding up to 30 people. We golfed 36 holes this morning and now I'm off with Cole to scout out the 3 skateboard parks in the Palm Springs area....why am I skateboarding when it's 106 degrees outside? We had way too much planned this weekend and the games ran really long. Matt Hall, one of our jr. high pastors, was slated to speak and on Saturday night he got up to start the lesson time with only 5 minutes left in the program. Doug Fields was speaking in the adult service, so it went short. That combined with us running long made for lots of parents hanging out waiting for us to finish up. Not even close. However I do have two life experiences that keep me from hating the sport entirely. 1) I was in Brazil in 2002 when they won the world cup. I was at a Youth Ministry conference and we actually had to postpone the conference and show the finals on the big screens in the church or the organizers of the event said nobody would show up. It was out of control! A thousand crazed youth workers painted green and yellow, conga lines, people setting off M-80's in the sanctuary. It was a moment I'll never forget. 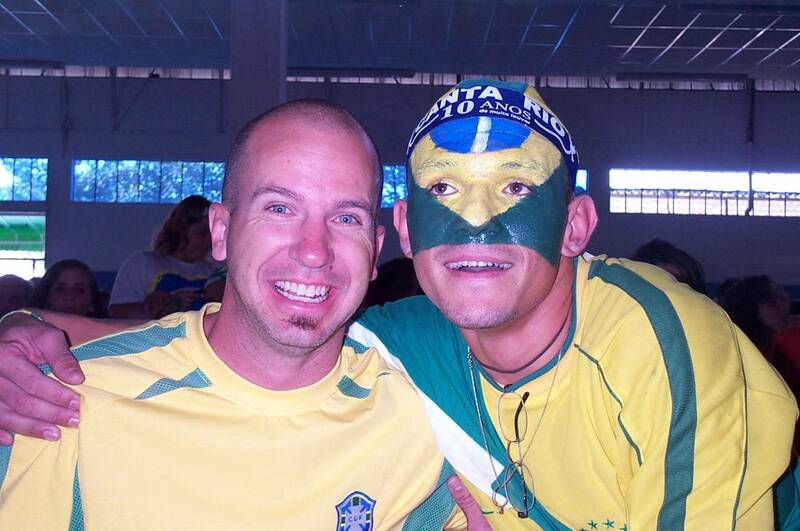 2) My brother-in-law is from England and is a huge soccer (football) fan. He's even taken the time to try to fill me in on some of the finer points of the game. Because of these two factors, I was surprisingly glued to the television today and terribly disappointed to see both England AND Brazil lose! I guess watching a few hours of soccer every four years isn't too bad.